Nothing like those three words sounds as satisfying after leaping across rooftops and running away from soldiers by any means necessary. Now I'll be honest, the first Assassin's Creed game wasn't my favorite. At all. It was not necessarily a bad game, but it did not grab me as much as its sequel did. The story picks up where the last game ended off. Desmond Miles is back and this time he escapes from Abstergo with employee Lucy Stillman, a fellow assassin. After meeting with two other assassins, Rebecca Crane and Shaun Hastings, Desmond enters the Animus 2.0 and relives the memories of his ancestor Ezio Auditore. Ezio's story is mainly his progression as an assassin after the murder of his father and two brothers. 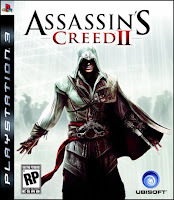 The setting takes place during the Renaissance period and Ezio travels between the cities of Italy. Italy. Yup. This was one of the reasons why I enjoyed the game. It's an open world and you get to travel however you like within the different cities. I could walk or run through the streets while cloaking within groups or pushing people aside while taking their florins. While running a path you could easily spot a crate, jump it, swing on a pole, climb that pole and sidestep onto a roof. And you can swim now! And fly! Yeah... Transitioning from the ground to the rooftops was very fluid and enjoyable and it easily distracted me from the main story. The story itself was... interesting. Tying in history into Ezio's story was neat and it got me to brush up on my Renaissance knowledge (okay I knew absolutely nothing about the Renaissance period except for a few things, so shoot me). The only thing that really bored me sometimes was Ezio himself. Yes, he wants revenge. I get it. I feel they should have kept his motives clear throughout. The emotions were there in the beginning, but after it seemed to drift away. Of course, this could be due to me just running and jumping around all over the cities while trying to do side missions (which don't get too tedious) instead of paying attention to the story (What? I'm easily distracted) The finale, however, did grab my attention. I read the logbook, reviewed all the memories and read the character profiles available to make myself caught up. That was neat. As for the rest of the gameplay, I found it was very solid. The combat was great and it is definitely a lot more satisfying (and more complex) than the first title. Sure you can single out an enemy and kill them with a rapier from behind and drag the body into a bale of hay, but you can do so much more. You can disarm somebody and use their weapon to kill them. You can swoop in, poison somebody, go back into hiding and watch your victim suffer. It can be very satisfying taking on ten guards at once and seeing them all fall with the strategic input of buttons.